Notes For Later: Visit, Select It and Check Your E-mail Inbox! How many of you browse Internet daily? If you are a browser like me (all time online) then I’m sure you don’t have lot of patience to copy some important text, web address when you are browsing, right? OK, here a new concept what I’m going to call it has “No Copy Paste-Select it and Click it, Check Your Mail Box” oh, not getting what I’m saying? Read on..
Greedy Labs recently launched his new project called “Notes For Later“. As the name itself indicates taking notes for later use. 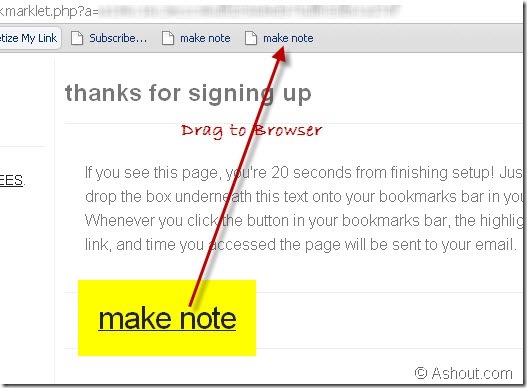 Notes For Later creates unique bookmarklet for each and every email you signed up to their website. After conforming your valid e-mail ID they will give you Unique Bookmarklet to you, just drag it to your browsers toolbar and kept there itself. When you visit any website, select any text you want to send to your mail box and click on that bookmarklet. It will send the selected text portion, website URL and time you have visited to that website information to your email ID. Isn’t cool? So, you don’t need to use any Notepad or any text editor to save text when you are browsing, Just select, click and check your email inbox. When I started using Notes For Later site, I didn’t know what it is, and how to use it. Because, there is not much information or they have not clearly mentioned how to use that website. So I’m writing steps to use Notes For Later website. After click Sign Up button, go and check your e-mail Inbox. You will see one link saying “Finish Sign Up!” option. Click on it. Now you will see unique Bookmarklet in your account. Drag “make note” to your browser toolbar. So now onwards you don’t need to open your notepad when you don’t have mood, just select it and click it! that’s it. When you are free copy that text or visit that website again with the help of notes for later email. Oh ya, it’s free service. Never heard before.Surely I’ll use it.Thanks for sharing. Great post! Noteforlater sounds like a great resource for browser like us. I think it will be pretty useful to just click and send instead of copying and doing all the work before coming to read it later. This is my first visit to your site and i loved it. Hi This would be really good for me. Most of the time when I browse I need to open a wordpad and copy paste the important points. You saved my time now. Thanks again. Nice tutorial man. This is my first visit to your blog and found the theme perfect. Thanks for sharing the information.. I have never heard about this… Copying and Pasting is such a panic and time consuming task. Just clicking and sending is interesting and saving lots of time.. I will surely use this tool..Hope It will be the best!